My boyfriend makes the BEST twice-baked potatoes. 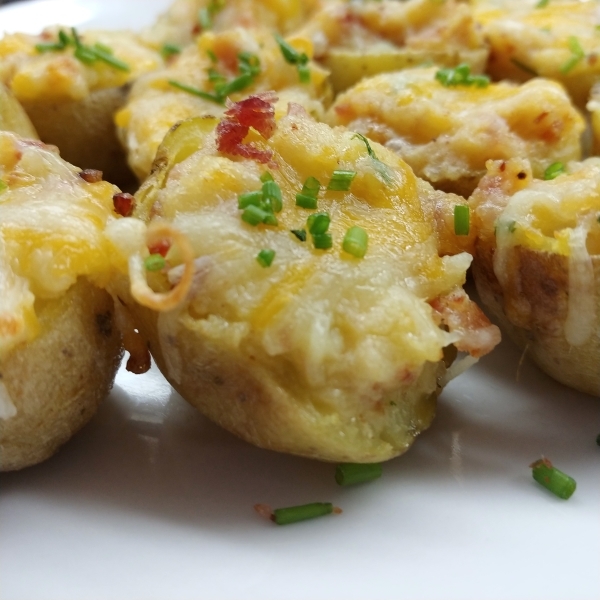 They’re chock full of bacon, cheese, and creamy potato goodness. I took his recipe and cut it down to appetizer size, perfect for parties of ALL KINDS, but especially for football parties. Plus it is gluten-free! Bonus! These baby taters are creamy, bacony, cheesy, and comforting. 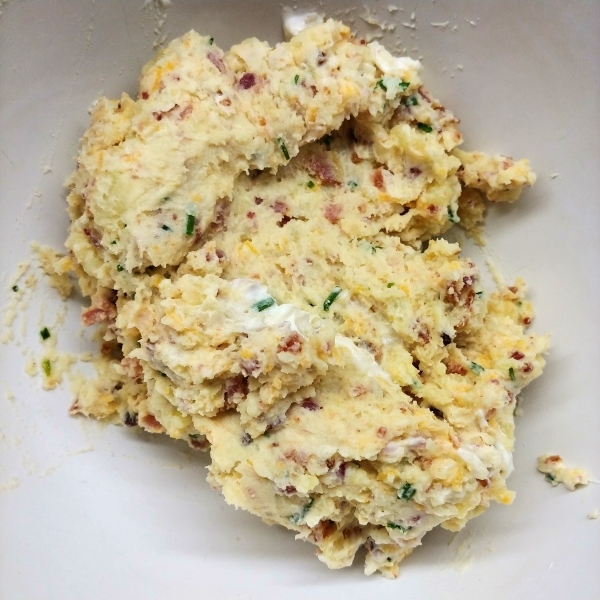 They’re everything good about mashed potatoes and baked potatoes, all thrown together into one perfect bite. They will disappear in mere moments, with everyone wishing there were more. AND, as with most recipes I really love, you can do most of the prep on these the day before, and finish them in the oven a few minutes before you want to serve them. Which means they’re perfect for making and taking to a party, where you can pop them in the oven and serve them nice and hot. Set your oven to 425F. Clean the little potatoes, making sure you check the drain for stragglers, and put them in a microwave-safe bowl. Stab each potato one time with a knife (so they don’t explode). Put a tablespoon of water or so in the bowl, then cover it with plastic wrap. Stab the plastic a few times, making a few vents. Put the potatoes in the microwave on high for 5 minutes. 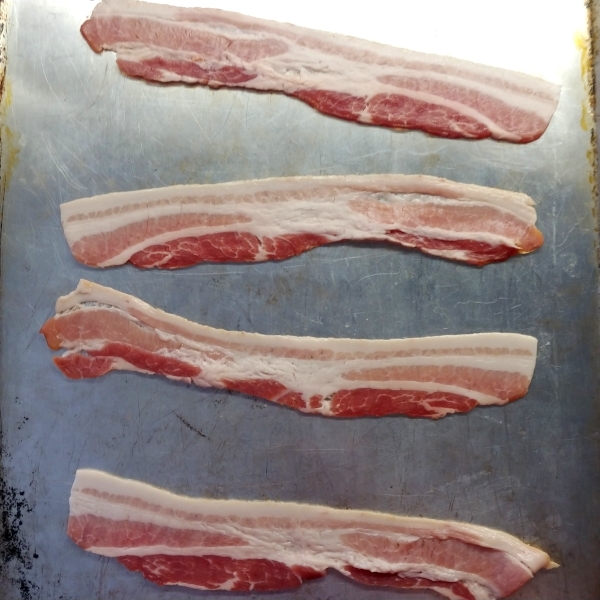 While the potatoes cook, Put your bacon strips on a sheet pan (or any pan with sides that doesn’t crowd the strips) and pop it into the oven. 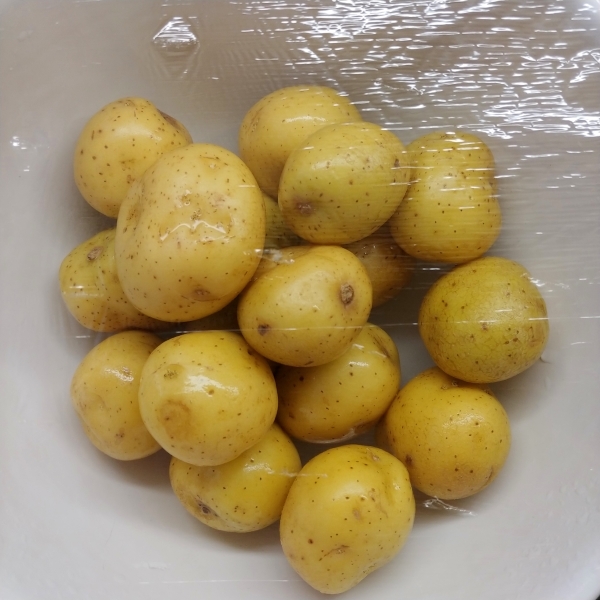 After 5 minutes, take the potatoes out (use a potholder or you may burn your hand straight off) and CAREFULLY peel the plastic wrap back. The steam is also murder, so stay away from it! Using a spatula, kind of flip the potatoes around a bit. Put the plastic wrap back on and put the potatoes in the microwave for another 5 minutes. When the timer beeps on your potatoes, your bacon should be done. Take it out and put it on a paper towel to drain. Check the potatoes: they should be slightly squishy when you squeeze them. If they’re still really hard, put them back in the microwave for another 3-5 minutes. When they’re ready, put them on a rack or sheet pan and pop them in the oven for 5 minutes. 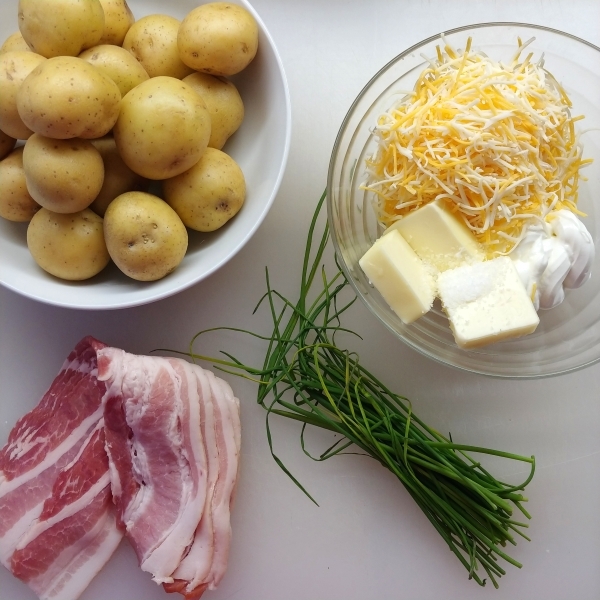 While the potatoes are in the oven, chop the bacon and 1/2 of the chives (you should have a few tablespoons of chives), making sure they’re pretty tiny. If you’re making potato footballs, chop the remaining chives into long and shorter pieces for the football laces. 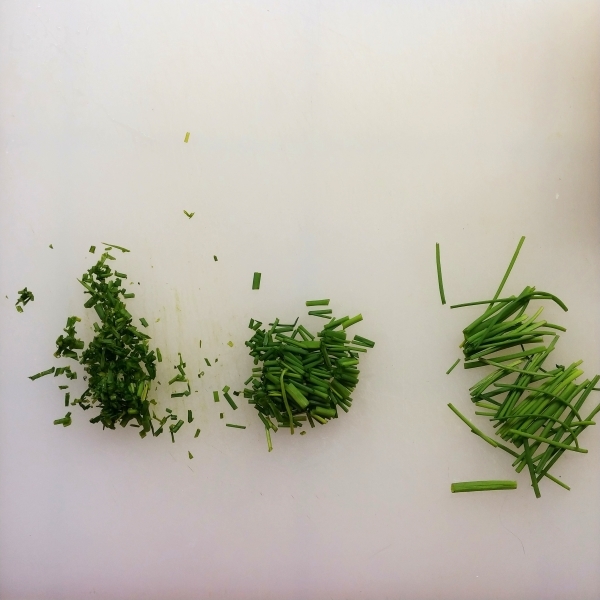 Otherwise, chop all of the chives tiny and reserve half of them. 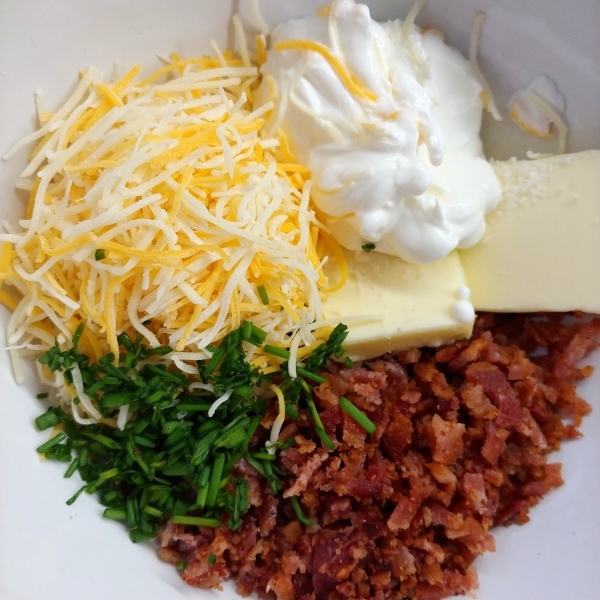 Toss the bacon, sour cream, 1/2 of the cheese, butter, salt, and 1/2 of the chives into a mixing bowl. Pull the potatoes out of the oven and let them cool for a few minutes while you clean up your mess. If you’re planning on putting the finished potatoes in the fridge to finish later, go ahead and turn off your oven now. Otherwise just keep it on. When the potatoes aren’t lava anymore, take your bacon sheet pan (which you just cleaned, right?) and either spray it with cooking spray or spread about a tablespoon of oil around the bottom, so the potatoes won’t stick. Cut each potato in half (along the shortest axis) and hollow them out, putting the potato insides into the mixing bowl with everything else. 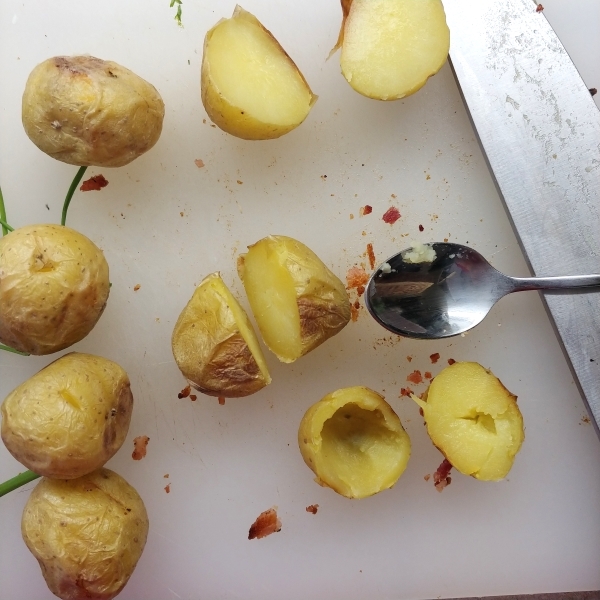 Try to leave a little bit of potato around the outsides of your hollow so they don’t completely collapse. When you finish, you should have a whole pan full of empty potato shells and a bunch of potato in your bowl with everything else. Mash the ingredients in the bowl together with a fork or potato masher (or clean hands). Fill each potato back up with the mixture. If you have some leftover potato innard mash, EAT IT. It is SO GOOD. At this point, you can cover your pan with plastic wrap and refrigerate it up to 24 hours before continuing. OR you can just go full steam ahead. 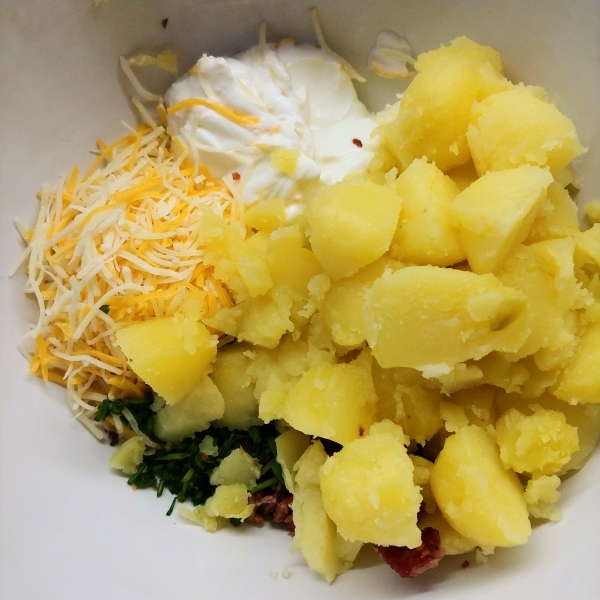 Sprinkle each potato with some shredded cheese (you should have 1/2 C to work with, you may not use it all). Top the cheese with your chives– either in the football laces pattern or just with chopped chives if you’re not in a baller mood. (I forgot to put the chives on before I put them in the oven, which meant that they didn’t stick as well for me as they should have. It’s easier when they kinda melt on in the oven. OH WELL, live and learn.) Put the potatoes in the oven for about 5 minutes, or until the cheese is all melty. If your potatoes were in the fridge, you may need 5 minutes more. 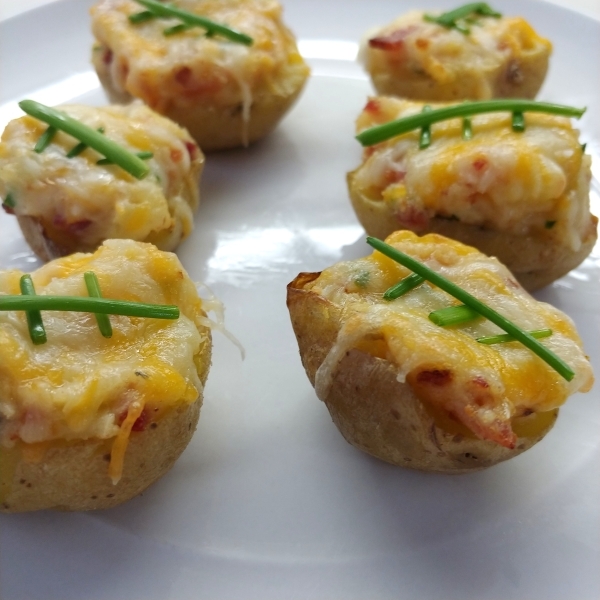 VOILA, tiny twice baked potatoes that are THE MOST PERFECT thing. ENJOY!